The deadline for Cardiff City to pay the first instalment of the £15m transfer fee for Emiliano Sala has been extended until Wednesday, 27 February. The Bluebirds were due to make the first payment to Nantes on 20 February, but BBC Wales Sport understands the clubs have agreed a delay of one week. Sala's body was recovered from the crash site and his funeral took place in Argentina on 16 February. Nantes wrote to Cardiff on 5 February with a request for the first of three instalments to be paid. 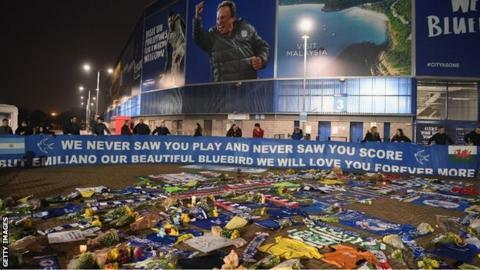 Cardiff said they were withholding payment while seeking "clarification" on details of the accident and want to wait until crash investigations are complete. They are also querying "anomalies" in contract details, but say they will be "honourable" with Nantes over the transfer fee if they are contractually obliged to pay. French side Bordeaux are due 50% of the fee because of a sell-on clause when they sold Sala to Nantes in 2015. If next week's deadline is not met, then the dispute could be referred to world football's governing body Fifa. It could be considered by its dispute resolution chamber (DRC), the body which arbitrates when players or clubs have a disagreement. Its chairman is former Football Association chairman and Fifa vice-president Geoff Thompson. Nantes told BBC Wales Sport "the process is progressing as normal" and they have not contacted Fifa. Should the clubs struggle to find a resolution the case could ultimately go to the Court of Arbitration for Sport, in Lausanne.